I wish each and every one of you fine folk happy holidays! May the dice always bestow good luck on you and may the stories you weave be exciting and fun! Those of you who enjoy this time of the year: May this year bring you joy galore amidst your favorite beings! However, those of you, who, like me, have rather ambiguous feelings towards the holidays: Do not let this time of the year get you down! You *ARE* cherished and you *DO* matter! Rest assured that I’ll be toasting to your health and a new year full of opportunities and good memories! As a bit of a teaser: January will be the month of the Frog God – I’ll be covering a lot of big books by the Frogs! I’ll tell you about the world of Uteria and the Suzerain Continuum and obviously dive head first into several truly crunchy supplements! From Shattered Heart to Darkwood, I’ll also be revisiting some intriguing adventure-series! Oh, and if you’re into the truly twisted material…2016 will see me cover Lamentations of the Flame Princess material as well as one of the biggest, most efficient horror-sandboxes I’ve seen in my whole career! There is a lot of excitement coming and I look forward to embarking further on this wonderful journey with all of you! I hope my giddy anticipation for the things to come extends to you as well! Here’s to each and every one of you – without you, there would be no endzeitgeist. From the bottom of my cynical, black heart: Thank you. This massive supplement clocks in at 63 pages, 1 page front cover, 1 page editorial, 1 page SRD, 1 page back cover, leaving us with 59 pages of content, so let’s take a look! Disclaimer: I was an IndieGoGo-backer for this book back in the day, but was in no other way associated with the production of this book. This was moved up in my review-queue as a prioritized review at the behest of my patreons. So, what do we get here: Basically, we get 6 schools of martial arts that teach so-called techniques. Techniques can be gained via a plethora of options: Number one would be the Martial training feat, which nets a character permanent access to one technique, which can then be used at-will. Alternatively, there is the Steel Discipline-feat, which nets 3+Int-mod Steel points per day, which can then be used as a resource to activate a martial technique. 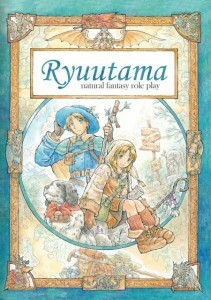 If the character already has grit, panache or kit or a similar resource, said resource receives an expansion and can then be used to activate a technique. Beyond that, one should realize that access to the school teaching the technique is considered to be a given requirement, putting the reins firmly in the hand of the GM, including a discussion on how to base technique-acquisition on roleplaying. Speaking of which: Technique-acquisition sans expenditure of feats via roleplaying also does sport a concise mechanic for such a means of introducing the material herein. All of this should already hint at the dual focus of this book: On one side, this book is all about giving martial characters more interesting options, but it is also about providing a social context for martial characters. “But what if a character has no x feats to burn?” Well, you see, that’s pretty much one of the truly beautiful components of this book: From antipaladin cruelties to gunslinger deeds, there are plenty of alternate class options to allow such characters to utilize the techniques introduced in this book, a component also supported via the new favored class options that are introduced with the explicit purpose of making techniques more easily accessible. This level of customization options btw. also extends to the techniques prerequisites, which come with 2 different sets: Essentially, just about everything regarding the acquisition of techniques is modular. Okay, so what exactly do we get in this pdf’s respective schools? Well, first of all, this is very much a roleplaying book, as opposed to being simply an enumeration of crunchy bits: Each of the martial schools sports a detailed, well-written introduction, concise pieces of information regarding the respective traditions, information on the respective training grounds, concise adventure hooks (including hazards etc. ), boons to be gained from a positive association with the respective school…and new magic items – including nutrition-granting tea, for example. The schools also provide unique feats as well as sample characters – a copious, diverse array of them. The intriguing thing about the crunchy bits here would be, to me, that they are ultimately perfect examples of Rite Publishing’s virtues as a publisher in that they blend high concept fluff with interesting crunch. Want an example? Sure: The Wushin Mountain’s diverse schools sport quite a few interesting feats, one of which ought to trigger all my hatred: Stone Swallower allows for the regeneration of ki, a limited resource. Why am I not frothing at the mouth and bashing it? Simple: For one, I love the idea that this feat requires the swallowing of stones for a unique visual. More importantly, though, the strict limitations of the daily uses of the feat render it powerful, yes, but also balanced. Now as for the techniques – there are a lot of them and a lot of schools to choose from: The dwarven-inspired Badger Style, for example, allows you to break free of grapples and even from being swallowed whole with penalty-less full attacks…and there is “Humble the Mountain” – which is just so awesome: If you hit a foe with it, you reduce the foe to a kneeling position before you, which, while not rendering the target helpless, makes for awesome visuals – and yes, flying et al covered as well. Scaling bonus damage based on BAB versus foes, ignoring DR and hardness may sound brutal, but ultimately, it is the limitations of the technique that render it mathematically feasible in EVERY game. What about a technique that allows you to retaliate against foes that attacked you before with increased efficiency? The polearm-based Axe Beak style lets you add weapon qualities temporarily to your polearm. What about a mechanically valid way of spearing your foe with a thrown polearm, charging him and retrieving the weapon in one fell swoop? The two-hand-fighting/double weapon-centric trickery of Fox Style allows you to increase your weapon’s reach and is surprisingly a style that allows for some unique tricks, while e.g. the Tanuki Style’s Shadow Dodge allows you to use smoke pellets for pretty awesome dodge-then-retaliate moves. Otter Style martial artists may kick foes back to strike them with their ranged weapons or execute ranged disarms and perform melee attacks with crossbows and bows and even grapple foes with your bowstring, strangling them! Now if all of this does sound too WuXia for you in style, you’ll be glad to hear that Western martial arts are covered in this book as well: The first of these would be pretty much your swashbuckling/fencing-style school that allows its practitioners to on-the-fly pick up disarmed weapons, ignore difficult terrain, etc. – including using 5-foot-steps to charge or force movement (save negates) with each attack you perform: A simulation of binding weapons with reciprocal movement can also be found among the techniques here. Very interesting from a mechanical point of view: The stances of this school allow for the modification of your initiative score, providing different benefits depending on your position – and if that sounds like too much book-keeping for the GM, just follow the pdf’s advice and have the player track initiative. It’s definitely worth it! The Third Suns (get it? “The first son inherits, the second is for the church, the third for the military…”) would be pretty much Zweihänder-based martial arts for templar-style knights: Here, we get glory-techniques that can provide the stuff of legends: Brutal offense, at the cost of potential vulnerability, this style is all bout high risk/reward ratios and potentially, means to find a glorious death…or triumph…which would be as good a place as any to also comment on the rather impressive fact that, where a given technique overlaps with a feat, the techniques actually feature proper synergy/additional tactical option, showing a thoroughly impressive level of system-knowledge and mastery. The Halls of Ivy under the Oaks, then, would be an elven tradition that is basically the representation of the concept of bladesinging, blending magic and martial arts: As such, the techniques require the sacrifice of spells…or, via a feat, impose a temporary penalty on your Constitution-score. Now here’s the interesting component: The sacrificed spell’s descriptors actually change the effects of the respective techniques! Yes, this is as well-crafted as you’d expect it to be. Better yet, the techniques provided herein allow for the expert countering of magic (and crippling of spellcasters further enforced by new weapon properties), making the technique a great alternative to similar tropes. There is also a truly devastating aura at long range that can utterly cripple the whole opposition with unique effects per descriptor- but at a steep cost to yourself that will mean you won’t pull it all the time. The Martyred Arrows school, strongly aligned with a clan of gargoyles, allows for its practitioners to utilize the unique teachings to part winds, make trick shots to cripple the opposition or fire a last-ditch shot at an opponent right next to you sans AoO or penalty…potentially in combination with other school-techniques. And there is Marty’s Arrow. Fire at a foe and save. If you make the save, you only are reduced to -1 hp. If you fail, you die. The opponent hit, however, also needs to save or die. If you choose to willingly fail your save, the opponent also takes bonus damage equal to your remaining HP. And yes, this is a death-effect. So, on one hand, I want to complain about this technique…but then again, I’m a sucker for heroic sacrifice last ditch shots and the scaling save means that even characters with a good Fort-save run a very real risk whenever they unleash this one…so yes, not going to complain. And then, finally, there would be the Ludi of the Waiting Koi – the gladiatorial type school. The techniques here are visceral and intriguing: As an immediate action, you can e.g. lower your AC as a response to an attack, interposing an attack with a net, tanglefoot bag etc. for one of the best counter-strike representations I’ve seen in quite a while. Better yet, as befitting of the school, we actually get synergy with performance combat and negating immediate and readied actions targeting you via shields allow for unique tactical options…and yes, net/piercing weapon-follow-up combos are part of the deal. Editing and formatting are very good, I noticed no significant glitches. Layout adheres to a printer-friendly 2-column b/w-standard with b/w-bamboo-borders and the pdf sports copious amounts of high-quality b/w-artwork, most of which is new. The pdf comes fully bookmarked. Timothy Wallace, Matthew Stinson, William Senn, Ben McFarland, Mike Wise and Aaron Phelps took some time to get this book done – sure. But know what: the wait was very damn well worth it! When Path of War hit sites, I expected that one to eliminate the necessity, but then was kind of disappointed by Path of War’s explicit focus on high-level gameplay, on fantastic power beyond the means of some tables. 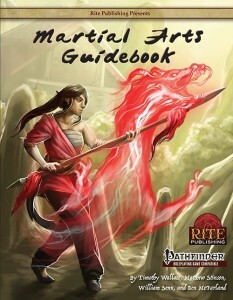 The Martial Arts Guidebook’s main difference from this system lies in multiple instances: For one, more than the crunchy bits, this is very much a sourcebook that grounds the disciplines in a concise narrative framework. The balance of the martial arts maneuvers here is impeccable – and it manages something I did not expect. The Martial Arts Guidebook takes table variation into account in an almost unprecedented manner. The fact that you have not 1, not 2, but, depending on how you count, up to 5 (!!!) ways to introduce this book’s content to your game means ultimately that, depending on your campaign, you can limit these or de-limit them. Want full-blown martial arts? No feat-tax, easy access. Want point-based mechanic? Available. Want feat-tax based techniques? You can have those as well. Even the most gritty of 15-pt-buy campaigns can use the content herein – and so can high-fantasy 25-pt-buy rounds: The system works organically and smooth in either and manages to display a thoroughly impressive synergy with feats – it is here the guiding hand of Ben McFarland as a superb developer of exceedingly complex material can be seen at work – even when limited resources can be regained, there is always a fair balance here, no power-creep – this book is NOT about numerical escalation, this book is about broadening the options, about making combat more interesting and diverse – and it excels at its goal. Let me reiterate this: On one hand, this is a thoroughly inspired book of crunch – but on the other hand, reducing it to this component would be a disgrace to the book; it is so much more. The styles presented here do not exist in a vacuum, though you can sure use them as such. 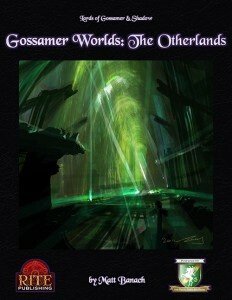 Instead, the detailed information on the schools in this book render the techniques simply intriguing, organic components that can guide full-blown adventures, with sample NPCs and hooks galore. I did not expect to like this book and absolutely feel in love with this book, particularly since the options provide amply unique gambits and tactical options that can be introduced singularly or as complete packages into any given campaign sans unbalancing the material. Let’s sum it up: Great fluff, great crunch, potentially perfect synergy with just about any Pathfinder-campaign…what more could I ask for? Well, simple: A sequel. The techniques provided in this book are brilliant and even if you take the crunch away, you’d get a thoroughly inspired book, one that has me wanting more. Whether Conan-esque grit, high fantasy WuXia or a more martially bent Western setting, this book delivers in spades – 5 stars + seal of approval and nomination as a candidate for my Top ten of 2015! 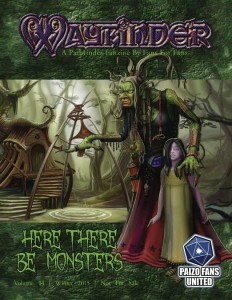 You can get this damn fine book here on OBS and here on d20pfsrd.com’s shop! This installment of Fat Goblin Games’ Call to Arms series is a massive, huge beast of 94 pages, 1 page front cover, 1 page editorial, 1 page ToC, 1 page SRD, 1 page advertisement, 1 page back cover, leaving us with 88 pages of content – that’s A LOT, so let’s take a look, shall we? Okay, we begin this installment of Call to Arms with a breakdown of what mantles are. Sounds strange? Well, it quite frankly shouldn’t be considered to be strange. Think about it – there is more to a mantle than just the cloth and material from which it was woven – as the pdf aptly demonstrates, wearing a mantle can denote more than just “the wearer is protected from the weather” – in real world history, mantles have often been used to denote status and ultimately, power. Sheer, brutal, in your face POWER – whether religiously or by the grace of the kings, a gorgeous mantle had its own weight, a kind of symbolic capital. Now picture what happens in a world where such options actually carry significance beyond the realms of the symbolic, a world wherein faith can literally move mountains and where authority can literally break the will of others – aye, there is untapped potential here! Similarly, there are armored mantles, but more on those later – for now, let us focus on mantles vested in authority – thus, we have ranks like acolytes, civilian commanders, scholars and the like – all covered, with respective boons associated with the mantles. This is brilliant not due to the respective mechanical relevance, but due to the social relevance and the sense of immersion it enhances; basically, we have items that enhance a world’s inherent consistency here, with fluff, titles, etc. all there for your convenience. Of course, this is not simply a book devoted to such prestige-mantles – we get concise tables of spell-level by class prices for mantles alongside a concise, easy to grasp break down of Item Creation of mantles. Obviously, specific magic mantles can be found within these pages as well – including cursed mantles and intelligent mantles…oh, and yes, mythic mantles – like the Lien of the Night-King…but what about the eponymous mantles of power? You see, here, things become interesting indeed: A mantle is not necessarily only a physical vestment of authority – it has a symbolic dimension: We do speak of the proverbial mantle of authority for a reason. 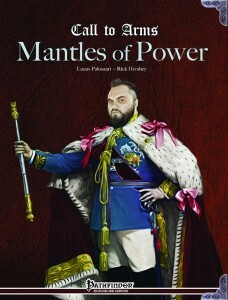 The pdf’s mantles of powers can be pictured as basically an item-based mini-template, as a kind of story-reward beyond what regular items would provide – and as such, their massive benefits do come with a hefty responsibility – and a CR-adjustment…as well as a “Geis,” for said power comes at a price…and requires investiture by a powerful being. Think of the mantles of power as particularly powerful emergences (See Imperiums CS), for example. Basically, these complex, exceedingly powerful mantles denote you as “the chosen one”, the champion of a deity, etc. and similarly, such power can also be used for antagonists: What if there are beings that successfully take the mantles of the Four Horsemen of the Apocalypse (not the writers!)? And yes, these mantles actually sport several abilities that interact with one another, allowing the wearers to consecrate weapons with their dread powers and tie them to their powerful tricks…and even better, there are ALTERNATE HORSEMEN mantles here as well…like anarchy or majesty, to give you two examples. Oh, and have I mentioned the war of the seasons and the fey courts? Here, things become full-blown campaign setting/AP-style detailed: Much like Dresden Files’ depiction of the fey, various positions in the respective courts of the fey coincide with mantles of power – from queens/kings to heir apparent, knights and jesters, there are A LOT of mantles of powers here – for each season! While summer and winter generally blend positions in court with suite-of-card like themes, spring and autumn have their titles aligned with opposing pieces of a chess set, sporting e.g. “rooks”. It should be noted that escalating mantles of general association and those highly prestigious mantles are all covered – basically, what we have here is a massive, template-based reward-system ready for your perusal that can be considered enough fodder for a whole campaign…or many of them. The significant level of power these offer may work btw. particularly well in low/rare magic item-campaigns. The significant ability-suites could offset the mathematical problems creeping in at higher levels to a certain extent. To give you a general idea of how long these mantles’ respective write-ups are: The CR+8 King of Autumn’s mantle covers more than 3 pages! And yes, the vast majority of this is CRUNCH. I am not kidding when I’m saying that these mantles can govern a whole campaign worth of material—or make for unique adversaries. Oh, and there would be neutral parties that also receive 4 mantles and the Sidhe and mocking midnight Court templates/mantles to further expand the material. Editing and formatting are top-notch – I noticed no significant array of glitches or issues. Layout adheres to a nice 2-column full-color standard and the pdf comes fully bookmarked for your convenience. The pdf comes with nice full-color artworks. Lucus Palosaari delivers essentially a bait and switch pdf – I went into this book expecting an array of magic mantles…and they’re in here. But this book is so much more. The notion of mantles as a social structuring element is a brilliant “why has this not been done before?”-moment that made me cackle with glee. Obviously, I went into the mantles of power-section rather skeptical – the obvious power-increase being just nasty…but know what? This section is x campaigns and villains waiting to happen. The brilliant horsemen mantles will be wielded by champions of darkness in my game (or by the players…we’ll see…) and then, there would be the fey-mantles. Okay, let’s get this out of the way: If you absolutely are not interested whatsoever in the whole war of seasons-concept, then you’ll lose a significant array of pages in this book: 47 pages, to be more precise, all of which are devoted to the fey mantles-come-templates for the respective positions and they are pretty much glorious: Granted, I am a bit of a fanboy for fey politics and unique effects and the blending of mythological, pagan tropes and the crunch here is very well-crafted. Moreover, we actually get information on the otherwise often neglected spring and autumn courts and, better yet, they receive their own mechanically-unique identities. 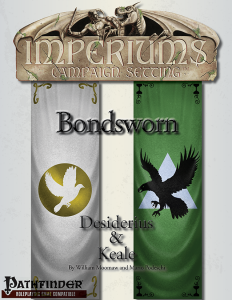 Essentially, this is a whole campaign’s worth of unique rewards just waiting to happen and the investiture and geis mean that such mantles are not only hard to get…they’re also hard to keep. Just think what poor Harry has to endure since he went Winter Knight…well, some geis make that look downright cute. I’ve been thinking rather hard on how to rate this book – the mantles of power themselves are utterly brutal and should obviously be handled with care…and this book is more of a narrative device than an item-book…but judging this book as an item book in the straight, traditional way would quite frankly be a disservice to the inspired material contained herein. I’d rather be positively surprised and inspired to make adversaries and extensive stories than have more replacements for cloaks of resistance that end up not being used. From the low-magic end of mantles as a sign of office and authority to the high-end fey-court intrigues, this supplement offers some truly inspired options – just don’t expect a huge selection of vanilla magic mantles. That being said, this book is imho better off for its chutzpah of actually doing something radically different – hence, my final verdict will clock in at 5 stars + seal of approval. Ultimate Charisma clocks in at 68 pages, 1 page front cover, 1 page inside of front cover, 1 page editorial, 3 pages of SRD, 1 page back cover, leaving us with 61 pages of content, so let’s take a look! Ähem. GET THIS NOW!!!! No, seriously, get this NOW! ASAP! This book belongs into the library of every Pathfinder group. No exceptions. None. Okay, you really want to read a gushing elaboration on how this book represents all that is awesome about 3pps? All right! A little history first: Alexander Augunas started Everyman Gaming to release a single, humble little pdf called “Psychological Combat.” The first iteration of this little book was good…and then, he made it better. What does Psychological Combat represent? Basically, the pdf constitutes the one “less than 5 bucks”-crunch book that tops my list whenever someone asks me which little pdf to get. It’s, sans hyperbole, the most used little rules-book in my game. What does it do? Beyond brilliant archetypes that allow you to use performance combat in regular battles, psychological combat takes one of the most jarring rules-components and makes it significantly more elegant: Feint, Demoralize and Antagonize – what do they have in common? They behave pretty much like combat maneuvers without actually being combat maneuvers. They also sport different, somewhat inelegant rules. Well, know what? Alexander Augunas has streamlined them into a more maneuver-like system that imho should have been the default way PFRPG utilizes them – his system is, from a rules-aesthetic perspective, simply glorious – a thing of true beauty and the codification of antagonize as a generally available maneuver renders this book absolutely SUPERB. There is a reason this made my top ten list of 2014 – it fixes one of the most glaring rules-holes in PFRPG in an inspired way. Now this alone would make this book downright superb – but how do you improve such a truly legendary little supplement? Well, you add in a book that is no less stellar: The Leadership Handbook. We all know Leadership, arguably the best feat in the game – and, as design-legend Ben McFarland has observed, Leadership constitutes a present for the GM: It denotes a thorough willingness to immerse your character deeper in the world of a given campaign…but it’s also EXTREMELY strong…to the point where my previous campaign had ALL PCs take Leadership. Alexander Augunas did something at once radical and visionary: He made Leadership, the best feat in the game, free for everyone. This sounds crazy, OP – let’s face it, downright insane. Know what? In the hands of a lesser designer, it would have been just that. However, we’re talking about one of the best crunch-designers currently operating in the 3pp-circuit. The Leadership Handbook’s codification of leadership as a universally available feature turned out to be downright brilliant, particularly so since the book also provided perfect synergy with the kingdom building rules. Basically, you choose perks to modify the type of leadership and reputation you have – you can utilize these perks for improving your kingdom-building prowess, make your own organizations, improve your reputation…and more. “But what if I don’t want a cohort or leadership?” There are loner perks, which allow for easy stabilization…or being a friggin’ one-man army that can, in mass combat, actually destroy hostile armies. Come on, can you envision ANYTHING more awesome than a lone high-level dud walking calmly towards an incoming army…and then crushing it? Yes, these rules actually supplemented the material to do just that. So that would be a basic amount of info regarding the absolutely superb basic frame this book was built on – but know what? It does NOT end here: This book sports ~ 1/3 of all new content: For one, there are significantly more perks to choose from, for both famous or infamous characters…and the concept of relationships is also explored, presented in a thoroughly concise and easy way that is ridiculously easy to grasp – we even get rules for dysfunctional relationships versus healthy relationships and the thus gained diversity is simply beautiful to behold…especially since all of this ties in perfectly with the aforementioned perk-system – a level of integration of holistic design that even extends to the traits covered in this book! Speaking of holistic design: Know how sometimes new systems feel tacked on, how books like this tend to just complicate matters? Ultimate Charisma is pretty much the antithesis of such design: This book is so incredibly concise, so well-crafted, so inspired, it actually makes vanilla Pathfinder feel less refined in comparison – and I’m talking about all components, from Leadership to psychological combat to kingdom building…and yes, this plays imho perfectly with Legendary Games’ kingdom-building expansions. I could go on and list the respective components point by point, but ultimately, this would not make this review better – in fact, it would artificially disjoin what must be considered one of the most concise, holistic experiences I’ve EVER read for any iteration of a d20-based system. Okay, in case this is not exceedingly clear by now: I consider this book to be a huge MILESTONE in design. To me, Alexander Augunas’ Ultimate Charisma represents all that is perfect and awesome about 3pp-material. There is literally no 3pp book apart from Raging Swan press Wilderness and Dungeon Dressing books that even comes close to seeing this much use at my table. There is no single session that goes by in which I do not whip out this book in one form or another. Ultimate Charisma is, no hyperbole, one of the most used books at my table – and its incredibly simple presentation that makes each and every rules herein simple and easy to grasp and does show the effortless-seeming design-mastery of Alexander Augunas. 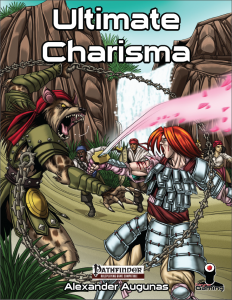 Ultimate Charisma is a perfect representation of why I do this whole review thing: This book belongs into the library of every GM, no exceptions. It’s a brilliant expansion of rules; it streamlines some of the most jarring components of PFRPG into a significantly improved version that plays perfectly with established components. There is literally NOTHING I do not absolutely adore about this superb book – to the point where I actually changed my format away from the point-by-point analysis because it simply would not do this wonderful book justice. You can get this milestone-level book here on OBS and here on d20pfsrd.com’s shop! This installment of the Advanced Races-series clocks in at 14 pages, 1 page front cover, 1 page editorial/ToC, 1 page SRD, leaving us with 11 pages of content, so let’s take a look, shall we? So, what are the Tosculi? Well, the simple reply would be that they are lethal wasp-people that sports a dread hivemind, nigh-sociopathic towards all but the members of their hive-cities…but much like NeoExodus’ Cavians, there are those that resist, the non-conformists – these hiveless tosculi, de-coupled from the free-will breaking militaristic society. Rules-wise, Tosculi get +2 Dex and Wis, -2 Cha, are small, have a movement rate of 30 ft. They also get 2 primary claw attacks at 1d3, +1 to AC, always treat Stealth and Perception as class skills and may share squares with other tosculi sans penalty. They also get gliding wings and may soften earth and stone 1/day as a SP. The class also has an alternate racial trait for gliding wings to bring them from 11 RP to 10 RP – absolute kudos here! The tosculi also feature 4 alternate racial traits – scaling tanglefoot spittle, a primary 1d4 bite, better AC…or detect thoughts as a SP…but at the cost of increased susceptibility to mind-influencing effects. All of these are perfectly balanced versus the race’s base tricks. New favored class options for alchemist, brawler, druid, fighter, monk, rogue, slayer and witch similarly are well-balanced indeed – no complaints here either! Of course, we also receive racial archetypes, the first of which would be the war-warper alchemist – instead of swift alchemy, these guys get a functional stinger, which can be used to deliver pre-prepared poisons…and at high levels, they may insert a cancerous, evolving mass into targets that can utterly cripple adversaries – icky and awesome! The Hivemaster druid can gain the vermin subdomain via nature’s bond or a vermin companion. Obviously, empathy for vermin, vermin shape wildshapes and a high-level swarm-form round out the archetype for a solid take on the concept, if not one that blew me out of the water. We also receive information on 3 different types of equipment: Abdominal spikes, blinding powder and tosculi paper (slightly resistant to fire) are interesting indeed. We also get 5 racial feats, two of which allow for better gliding via the wings and even altitude maintenance in a limited way, while two others represent tosculi teamwork feats – which are okay, but a bit weak. On the other hand, the final feat, which allows you to make powders and splash weapons work as lines instead via Wing Fans is downright brilliant. The pdf also provides a 4-feat Style-feat-chain focusing on grappling and damage-output via natural weapons for a solid option array. Regarding magical weapons and items, we get wasp-swarm bombs, a rod for hivemind-like attunement of participating characters. Salves that enhance defensive capabilities or a dazzling blade as well as a cool living spellbook are found herein as well and a fully stated old tosculi transmuter at CR 9. The pdf closes with 7 new spells, which include a ghostly stinger dealing force damage a hive haven, retributive swarm cloaks, better senses, temporary warrior evolution into a tosculi warrior (stinger + wings) and a spell to strengthen a hiveless tosculi’s vestigial wings. Editing and formatting are very good, I noticed no significant glitches. Layout adheres to Kobold Press’ beautiful two-column full-color standard and the pdf comes fully bookmarked for your convenience and the pdf sports gorgeous full-color artworks. The pdf comes fully bookmarked for your convenience. 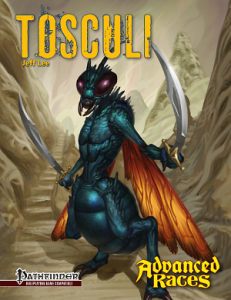 Jeff Lee and Ben McFarland’s Tosculi are perhaps the most streamlined race in the whole series: Perfectly balanced, there is nothing I can complain about…oh, and then there’s the explicit note about fine-tuning balance, the great fluff and several pieces of intriguing, thematically fitting crunch that supplements the book rather well. This is pretty much a fun, awesome little racial book; A truly refined, well-written installment, a great little racial book and well worth 5 stars. This installment of the evocative Gossamer Worlds-series clocks in at 18 pages, 1 page front cover, 1 page editorial, leaving us with 16 pages of content, so let’s take a look! So, we begin this installment of the Gossamer Worlds-series with a warning – the theories herein are considered heresy by the established Lords and Ladies. You see, among the vast plethora of worlds and realities accessible, or so goes the hypothesis herein, there are some that may be considered…semi-sentient. Or at least “alive” in the broadest sense that the reality grows…like a plant…or a tumor. From a seed of contact, a chrysalis springs, ultimately leaving only a husk reality behind – or so goes the hypothesis. You see, the otherlands constitute a kind of template, a kind of change – the reality does not overwrite completely a given world, but changes it into something creepily uncanny. The pdf uses a combination of “fey” and “alien” to describe the phenomenon and I am inclined to concur. Denizen-wise, we receive information on a few of them – the shining ones, which may or may not be the origin of fey myth; the Umbra-touched scattered ones and the hungry ones, which may be the origin of ours fear of giants, man-eating ogres and the like. The most powerful agents of the otherlands, though, remain the emissaries – we receive the full stats of such a being, the disturbing lady featured on the old cover. Finally, following the theme of otherness, doppelgängers are covered – spirits that may assume the guises of others, further cementing the theme of something subtly wrong with reality. From Tír na nÓg to the underworld, some examples are provided herein as well and, as always, we conclude this brief sojourn into the weird with a list of the world’s properties and advice on how to use it. Matt Banach’s Otherlands resonate with me – you see, neither jump-scares (which just startle), nor more traditional horror tends to do it for me. I’m not afraid irl of physical confrontation, nor of accidents, flights, water…you get the idea. The imagery of a raindrop falling in reverse, vanishing in the clouds? That’s the stuff my nightmares are made of I still consider Koji Suzuki’s Edge to be one of the creepiest books ever – what if Pi stops behaving like it ought to? …You may now resume laughing at me, but to me, this wrongness is the stuff of my nightmares. Otherlands taps into this type of uncanny wrongness and does so in a great way…but at the same time, I think it does not follow through with its awesome concept – so, you have this invading reality…where are the modifications on how powers, perhaps even Umbra and Eidolon, work? Dissolutions of a Lords’/Lady’s powers? Essentially, this book provides a seed from which one can craft more and it does so admirably. At the same time, it falls short in that it does not provide a concise means to have these effects provide mechanical repercussions beyond the inspired fluff. My final verdict, hence, will clock in at 4 stars – a conceptually awesome pdf that “only” manages to be good on its own and needs the reader to come fully into its own. This pdf clocks in at 26 pages, 1 page front cover, 1 page editorial, 1 page Toc, 2 pages explanation on how to use, 1 page SRD, 1 page back cover, leaving us with 19 pages of content, so let’s take a look! Okay, so the cyborg as envisioned here is a base class with d8, 6+Int skills, 3/4 BAB-progression, good Fort- and Ref-saves as well as proficiency with simple weapons and any weapons installed in modifications as well as light armors, but not shields. Obviously, they get Technologist as a 1st level bonus feat. The base class’s modifications are more defined by two particular abilities, though, the first of which would be the Internal Nanite Matrix – this matrix nets the cyborg a scaling array of central nervous system powered nanite charges (abbreviated as NC), which can be used to power cybernetic modifications as well as tweaks. The array of these points would be equal to 5x class level + Int-modifier, with 8 hours of resting restoring the NC points expended; tweaks need to be prepared in advance. 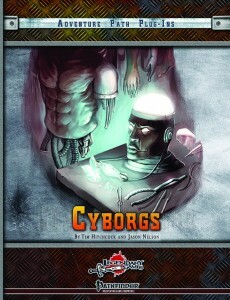 1st level cyborgs begin play with a basic cybernetic modification and are part of the cyborg’s body and thus not subject to disarm or sunder, with duration and power being determined by class levels attained. The cap for using NCs to power these enhancements is equal to the cyborg class level reached and unless otherwise noted, the modifications can be used at will, but have a cool-down period of 1 minute, during which they cannot be used again, preventing the spamming of individual choices. 4th level and every 4 levels thereafter net an additional such modification. The respective cybernetic modifications the cyborg can choose are interesting in that they tend to have more than one potential use – the basic spine-enhancer that provides an ability-score boost can e.g. provide either cerebral or spinal enhancements. On another interesting note, there are also some modifications that replace certain parts of the cyborg’s body -arm modifications, for example, replace the cyborg’s arm and hand – on a nitpicky note, I’d very much have appreciated this one precisely stating that the arm in question also eliminates the wrist slot, but that’s just me being complaint-prone. Arm-wise, you can get a weaponized mechabot arm for a circular saw blade arm that can be activated via NCs or get a medibot arm that not only improves healing capacities, it can also unlock certain spells as tweaks usually restricted for spinal implanted cybeorgs. powered arms and shielding arms complement this section and cyborgs may also elect to gain Propulsion Boosters, which may be used for water, underwater, etc. travel of 60 ft + 10 ft. per level in brutal bursts or use this booster to enhance his bull rush/overrun attempts: The jerky burst of speed feels very cyborg-y in its rules to me – kudos! Not all enhancements are this precise, though: Take Regenerative Nanites, one of the dermal implants: “The nanites require exposure to external power source to function. When created, the cyborg chooses a single type of energy (acid, cold, fire, electricity, negative energy, or sonic) to power the nanites. When activated the nanites grant fast healing, repairing a number of hit points each round equal to 1 + the cyborg’s Intelligence modifier, +1 additional point per 5 cyborg class levels. Once damage is fully repaired, the effect stops and the implants must be recharged.” Does this mean they’re only triggered by being subject to the energy? The wording seems to imply it, though usually, one such energy actually eliminates the nanites and, depending on the energy chosen and the free cantrip-availability of some of them, we might be looking at an easily cheesed infinite healing exploit – and sans the caveat, a similarly easy, but slow infinite healing exploit that is not suitable for every game. From sonar-powered blindsight to oxygen-storing gill-like enhancements and short-range bursts of sonic damage, the class per se features several intriguing and visually compelling enhancements – though aforementioned sonar projector either has a DC that’s simply too high or a glitch – instead of 1/2 class level, the save DC is determined by adding full class level, which not only deviates from other abilities of other classes, but also from the majority of abilities of the class. Indeed, such minor imperfections can be found slightly more often herein than usual for a Legendary Games-supplement: The Force Pulse ranged stunning-option, for example, do not specify the damage type the pulse deals. Powerful, at-will NC-based eye-rays can also be found herein, though they do not remain the only component and tool at the cyborg’s hands: Starting at 2nd level, the cyborg gains a nanite surge, which nets 1d4 temporary NC that can be assigned to a given modification, but not to a tweak. The cyborg gains another such surge at 5th level and every three levels thereafter, which can also be freely dispersed between a single surge or different, smaller surges. Additionally, the humanity loss incurred by cyborgs is represented by Charisma-decreases at 5th level and every 5 levels thereafter. One the nitpicky side, the ability can’t seem to decide whether “1 point” or “one point” increase of an attribute should be considered to be the standard. 7th level sees the cyborg determine a rapid recharge modification, which then decreases the recharge-interval. The cyborg may choose an additional such ability every 5 levels thereafter. Cyborgs also cast a type of “spells” called tweaks – these would be governed by Int and are somewhat different from regular spells in that, while they need to be prepared in advance, they are not expended upon being used – instead, they consume NC equal to their level – these “spells” are called tweaks and unlike spells, the cyborg is bound by his level regarding the amount of tweaks known Tweaks may only be replaced at 4th level and every even-numbered level thereafter. The interesting thing regarding these tweaks beyond their uncommon resource obviously lies in their restriction – basically, the modifications also determine the tweaks available – cyborgs with eye-enhancements get different tweaks than those with modified legs. The pdf also sports 3 feats for cyborgs – while obvious what Anthroposophist means “You resist the effects of humanity loss to your Charisma by 1.”, it is simply not too elegant in its wording: “resist” usually denotes resistance, which is the damage-reducing terminology usually employed for energy types and thus implies a flat-out reduction of the attribute decay. This, however, is contradicted by the ability to take the feat multiple times – the wording here could be more precise. The other feats allow for additional NC and the ability to use your body to boost tweaks: This is problematic, though: “You can bolster the effect of one of your tweaks increasing its power level for one use.” All right, by how much? I get the Con-based duration, but the feat’s actual effects, alas, remain somewhat opaque. The pdf also sports archetypes for the cyborg (and other classes) – the cybermancer learns a limited amount of sorc/wizard spells as tweaks instead of modification mastery…and this one s pretty nasty: NC-based fireballs? OUCH, particularly since spell surge replaces the nanite surge and can be used to temporarily increase the CL. Hunter-Killers do not gain Technologist or Tweaks, but do gain a rogue’s sneak attack progression and 8th level Death attack as well as quarry and an EX-based invisibility…which is very powerful and should, in spite of the flavor, probably be SP, if only for balance/invisibility-counter-measures – as written, this ability is extremely strong, borderline broken with Death Attack. Mechlancers get a cavalier-like mount that is subject to their class abilities and share NC between mount and cyborg – odd: The archetype does not pay for any of the better charges and the like, with the exception of a stunted tweak-progression, which is kind of nasty. Additionally, the archetype fails to specify how cybernetic modifications affect the mount – can the mechlancer modify the mount as a separate entity or is it treated as an extension of the cyborg? I’m not 100% sure and quite frankly believe that this archetype needs clarification. Bloodragers may elect to become techragers, which get the artificer domain power, crafting, DR and minor bonuses versus poisons, death effects, etc. and at high levels, you may infect foes with a nano-virus than send them into unconsciousness, then kills them and adds a final insult to the injury by making the victim a cyber-zombie, as represented by the template featured herein. Editing and formatting, on a formal level, are pretty precise; on a rules-level, though, there are more ambiguities in here than I’m comfortable with. Layout adheres to Legendary Games’ beautiful two-column full-color standard for Iron Gods-plug-ins and the pdf comes fully bookmarked for your convenience and sports the good type of unobtrusive hyperlinks. The pdf sports gorgeous full-color artworks, some of which you’ll know, while others are brand-new. As much as I love a significant section of this pdf, about 3/4 of it, the rest ties into it and is seriously flawed in some sections, dragging down the book. My final verdict, with a heavy heart, will clock in at 3.5 stars, rounded down to 3 for the purpose of this platform. You can get this inspired, but also flawed class here on OBS and here on d20pfsrd.com’s shop.